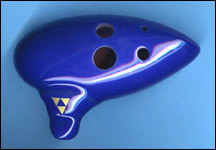 Anyone interested in the ocarina must visit the Songbird Ocarina website. The fellow that put the website together sells his handmade ocarinas (and other hand flutes), but he also provides history, videos and audio files on him playing, tips, sheet music, etc. I quickly got the sense that this guy loves what he does, which made paying the price for one of his ocarinas much easier to accept.